On a daily basis, I say whatever is on my mind. I love social media and tweet and update my Facebook status often, without even giving it a second thought as to what I just tweeted or updated. How blessed (fortunate, lucky, – insert whatever word you feel comfortable with) I am to live in a country where I have freedom of speech. Freedom of expression. I truly cannot fathom living in a place where I wasn’t free to say whatever I wanted. Worse yet… live in a place where I would be arrested for it. This is exactly what happened to Nabeel Rajab, a prominent leader of Bahrain’s human rights movement. He was convicted in August 2012 and is currently serving a two-year sentence for tweeting anti-government comments on Twitter. 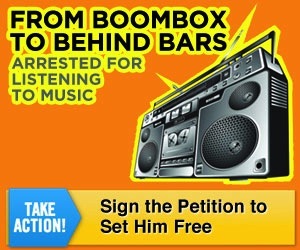 And Marcos Máiquel Lima Cruz (along with his brother) has been imprisoned since Christmas Day 2010 for playing songs by a Cuban hip-hop group whose lyrics criticize the lack of freedom of expression in Cuba. One brother was released, but the other is still behind bars. I hope you will take a stand on freedom of expression and join me in signing this petition we can help free both Nabee Rajab and Marcos Máiquel Lima Cruz and reunite him with his brother. Let your voice be heard! No mas oppression! No mas censorship! No mas silence! 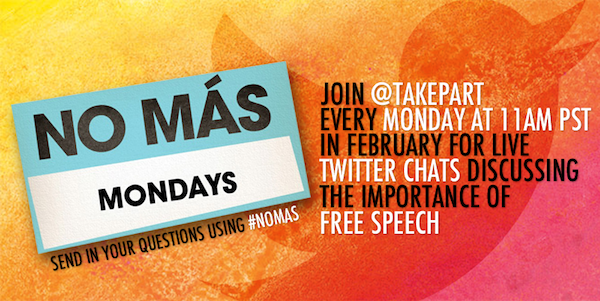 Change can start with two simple words…”No mas!” What do you say, “No Mas” to? Please go make YOUR “No Mas Badge“! I do hope you will join me in signing the petition above to free these two men, watch the video and be inspired to say, “No Mas!” And create your own badge to show the world what you are saying “No Mas!” to. Remember, it can be something lighthearted. Disclosure: Thanks to Linqia for sponsoring today’s discussion. All opinions are my own, and this campaign is something I strongly believe in. I take my freedom of expression for granted because I don’t have the courage to speak up. Honestly, I never take my freedom of speech for granted – it’s the most important part of being an American! I do but i make sure that it won’t sound insensitive. 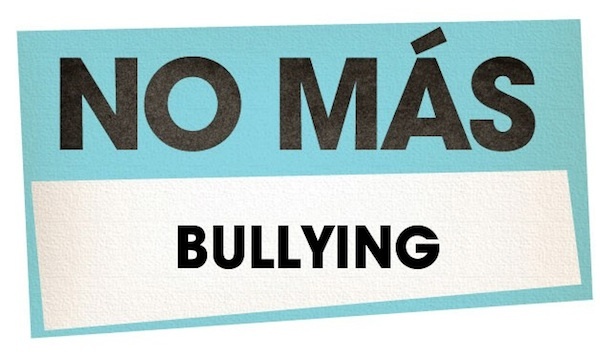 I all for NO BULLYING…. I try to be sensible when i post something on my social media wall. I hear you… I’m never mean. But to think just voicing your opinion could get your put in prison, is scary. I think everyone should take the same stance! Thank you for this post.. I am sharing..
As an artist as well, my freedom of expression is very important. I do not take my freeom of expression for granted. It’s so scary to think what it would be like to live in a country where you couldn’t say what’s on your mind. That is crazy! I totally take it for granted, and at the same time and very cautious what I say online. Emily, it pays to be careful what you say online because it can come back to bite you. I try not to say anything online I would not say in real life. But yes, I would hate not to be able to say what I wanted for fear of being arrested. I too am usually really careful about what I say online, but I can’t imagine not having the right to say what I wanted to if I wanted to. We do often take our freedoms for granted here. I never shut up so I need my freedom to express myself. Yes, I take it for granted and I’m very cautious of what I post/say online. I take so much for granted living in the USA!